The commercial carpeting seen on the floors of so many museums is oftentimes blah, ugly, or at best: invisible. The floor is a perfect place to execute a creative idea. It’s a fresh, unexpected spot. Here are some examples that I’ve seen. 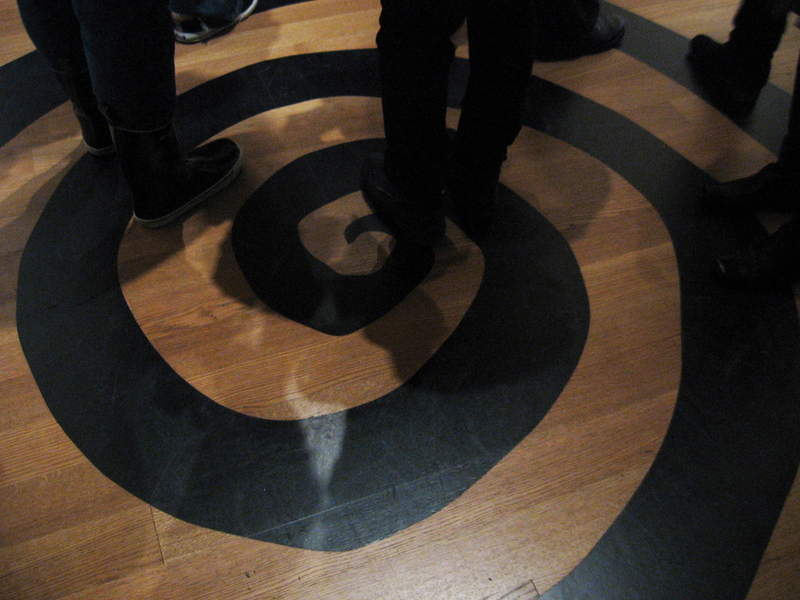 Below: On the floor outside the entrance to the Tim Burton exhibition (still on view at the Museum of Modern Art in NY) is printed a spiral that collides with and veers up onto the wall, ending in an arrow that points the way to the gaping maw of the exhibition’s entrance. No doubt inspired by Mr. Burton’s distinctive style—perhaps directly inspired by this painting mentioned in MoMA’s blog—the spiral is fun and a favorite detail from the exhibition design. 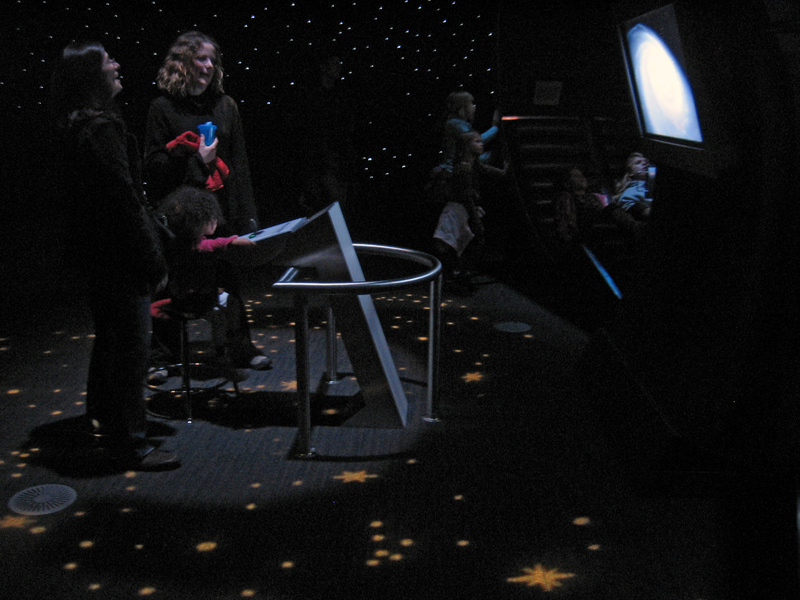 Above: Within the Exploring Space exhibit at the Connecticut Science Center, there are stars above and around you, in the form of tiny flickering LED lights embedded in the fabric-covered walls—and there are stars below you, projected onto the floor with GOBOs. If you’re the imaginative type, this dark, starlit room allows you to pretend you’re in deep space. You can see more from that museum visit in this previous blog post. Below, left: Another example from that same exhibit. Because the video monitors were set in a row, many people could stand around and watch without crowding, and because they were set into the floor, it was a novel way to watch the short video, about animals’ adaption to the wet and dry seasons of Africa. This exhibit had a few interesting things going on with the floor: 1. More than one type of flooring material was used to give the floor different textural feeling underfoot. 2. It made use of interesting colors and patterns. 3. 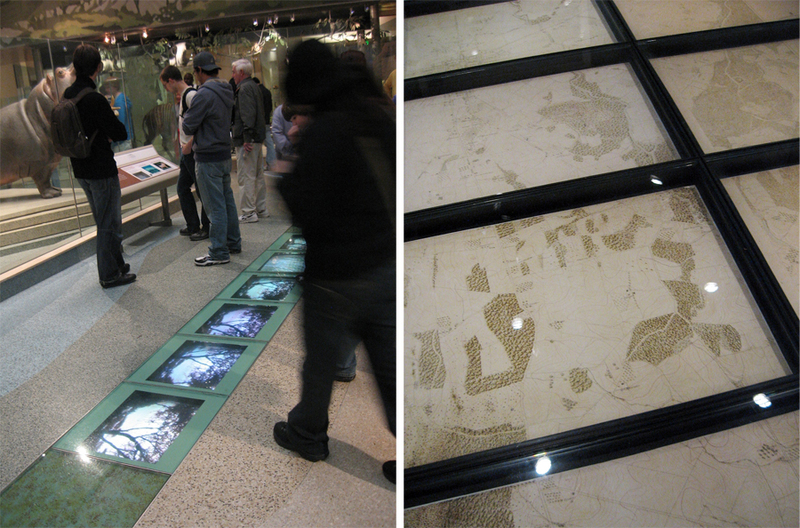 It integrated the exhibit’s main messages directly into the floor. These are just a few ideas. I’d love to hear about an exhibit floor you’ve seen that made an impression on you. Thanks for your flooring post! Nice to draw attention to surfaces under our feet, they are so often neglected. Yes, I love the idea of incorporating this often ignored surface into design! The Pointe-à-Callière Montreal Museum of Archaeology and History has a very memorable floor too! 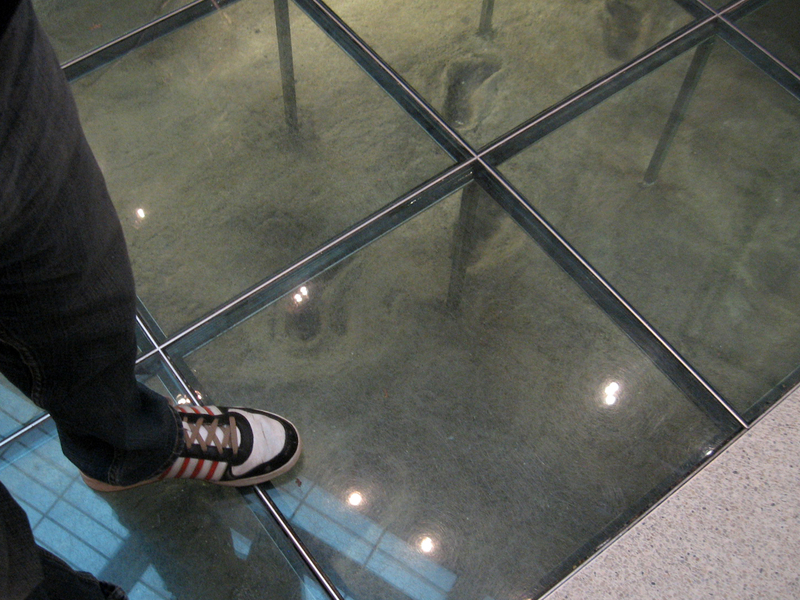 It’s a scale model of the Old Port in Montreal from its early beginnings to today embedded in the floor . Definitely makes you want to look down! This graphic intensive: ( http://www.aldrichpears.com/twos.html# ) SEGD award winning exhibit uses some large floor graphic coverage that doesn’t become as apparent unless viewed from the 2nd level. One more example of printed floor here: http://www.activteam.com/activteam_engl_1/ibatur_stand.htm See the borders of this booth printed like water.